This Hazard Recognition Course will guide you through all aspects of workplace hazards, from Slips, Trips and Falls to Fire and Electrical Hazards. Our comprehensive course will explain in detail what you need to know, emphasize key points and test your knowledge retention after each module. The course has been designed to meet and exceed Occupational Health and Safety Guidelines. By completing this course you can improve your knowledge of an important part of workplace safety. After completion of this course you will be issued a certificate of completion. 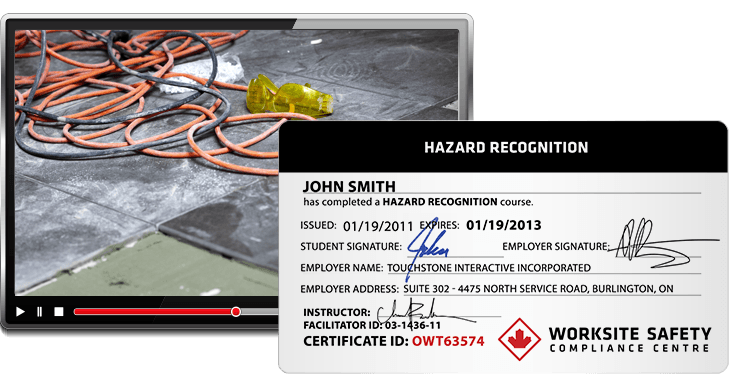 Hazard Recognition is the process of identifying and eliminating hazards in the workplace. All employers are required to show diligence when training employees. By taking this online training course, employees will achieve OHS compliance.